Emily and Martin appear to be love’s young dream. However their worlds are turned upside down when Emily’s psychiatrist prescribes a new drug to treat her anxiety. As Emily experiences unexpected and dangerous side effects, neither the symptoms nor the cure are quite what they seem. Directed by Steven Soderbergh, Side Effects stars Jude Law (Sherlock Holmes, Hugo) in what The Guardian called "his best performance since The Talented Mr Ripley", Rooney Mara (The Girl with the Dragon Tattoo, The Social Network) Catherine Zeta-Jones (Rock of Ages, Oceans Twelve) and Channing Tatum (The Vow, Dear John). 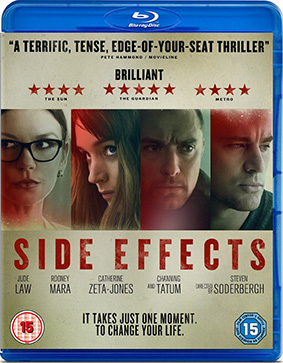 Side Effects will be released on UK Blu-ray and DVD on 29th July 2013 by Entertainment One, or eOne Home Entertainment if you like, at the RRP of £17.99 for the DVD and £19.99 for the Blu-ray.